This spring has been wonderful for wildflowers in Westborough’s woods, and if you’ve walked near a damp or swampy place, you may have been treated to one of spring’s fleeting treasures: the small, lacy white flower clusters of our native dwarf ginseng. Why is dwarf ginseng (Panax trifolius) called dwarf? The most obvious reason is that the plants are small. At 2-8 inches high, they’re short enough that they’ll probably catch your eye only when in full bloom. 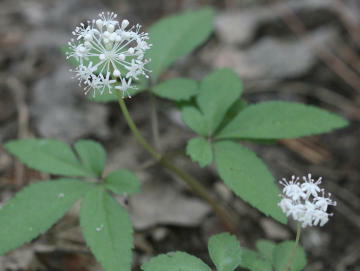 At that time, the ball-like flower heads of delicate, lacy blossoms are a special treat. Another likely reason for naming the plant a dwarf has to do with a comparison to a much larger relative. Dwarf ginseng bears some resemblance to the more well-known American ginseng (Panax quinquefolius), which grows 1-2 feet high. But don’t worry about having to tell the two plants apart, although the difference in size would make it easy to do. Unfortunately, you’re unlikely to find American ginseng in the wild. American ginseng became extremely scarce due to over-collecting in the 1800s and 1900s. It suffered this fate because of similarities with yet other relatives, the Asian ginsengs (Panax ginseng), which were (and still are) in demand in traditional Chinese medicine and Western folk medicine for substances in their large, fleshy root. Today American ginseng is also cultivated commercially, although it generally takes at least five years for its root to grow large enough to be marketable. 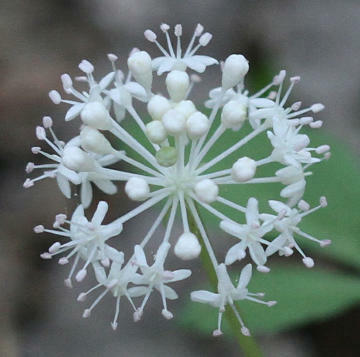 Dwarf ginseng blooms in a ball of tiny, delicate blossoms. Is the dwarf ginseng found in Westborough’s woods and elsewhere also in danger? It has largely escaped the fate of its more famous relative due to its dwarf status. Not surprisingly, dwarf ginseng’s root is tiny – a small round ball only about half an inch wide – and does not contain large quantities of the substances that make its cousins desirable. But dwarf ginseng is uncommon enough that you should not pick it or collect it. Like many native plants, dwarf ginseng was known to Native Americans, who found medicinal uses for it but clearly did not wipe it out. They treated an assortment of ills with it, including chest pains, headaches, colic, hives, and gout. When it comes to reproduction – which is what flowering is all about – dwarf ginseng is somewhat unusual. The plants can switch between producing mostly male flowers (which bear pollen) one year and producing mostly bisexual flowers that serve as female flowers (by producing seeds) in another year. Smaller plants usually produce male flowers. The largest plants are the ones that have bisexual/female flowers, possibly because it takes a lot of energy to make seeds and fruit. After producing yellowish berries one year, a plant usually switches to male flowers the next year. It has been estimated that every year about one fourth to one third of the plants in an area switch from producing one kind of flower to the producing the other. Dwarf ginseng is pollinated by solitary bees (wild bees that typically don’t live in cooperative groups that way honeybees do) and flies. The plant is in the carrot family (Apiaceae). You can only find dwarf ginseng for a short time. Each year dwarf ginseng has a fleeting above-ground life of only about two months. Then the foliage dies back and the root lives underground until the next spring. If you see dwarf ginseng this spring, enjoy it in place and consider yourself lucky!